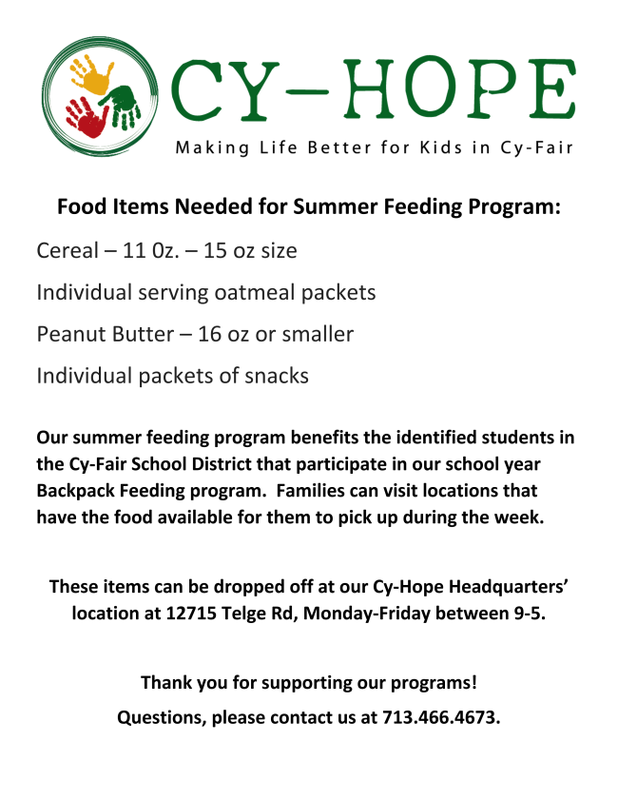 In an effort to prevent childhood hunger and to provide each child the opportunity to succeed in school and life, Cy-Hope has partnered with the Houston Food Bank to bring the Backpack Program to Cy-Fair ISD. Each week, students enrolled in this program receive a backpack of food that will help sustain them through the weekends when school food is not accessible. We currently serve 69 schools, which includes 1,500 children. Our goal is to have all 49 Title I schools participate in this program. Items needed for our Summer Feeding Program. List available HERE. Interested in volunteering for our programs? Select the programs that interest you and submit your name and email to be contacted. You can also call 713-466-HOPE (4673) to learn more.